It's nearly time to vote for the student execs who will lead your sport clubs, activity groups and societies next academic year. Now though, it's your chance to put yourself forward to be one of those exec. Nominations open Wednesday 10th April and close Sunday 28th April, with voting on the 1st and 2nd May. Want to become an exec? Some groups have other roles available, like Event Coordinators and Social Media Officers. Have a look at the nomination portal to see what exec positions are open in each group. Why should you be an exec for a sport or activity? Being an exec looks amazingly good on your CV, builds your confidence and gives you transferrable skills you can use in any workplace, such as leadership, communication, planning and problem solving. You are a member of the group you want to be an exec of. 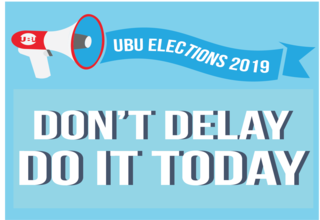 To join a group, search for them on our website and click "Join this group"
UBU will offer full training and support to all our execs starting as soon as you're elected in May, including specialist training days for our Presidents in September.